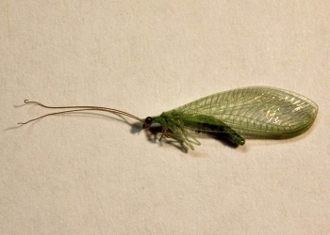 Green lacewings are in the Order Neuroptera, Family Chrysopidae. Their larvae are popular in the agricultural industry, as are adults which also feed on small insects. Called aphid tigers, the larvae are voracious predators of aphids and other crop damaging insects.